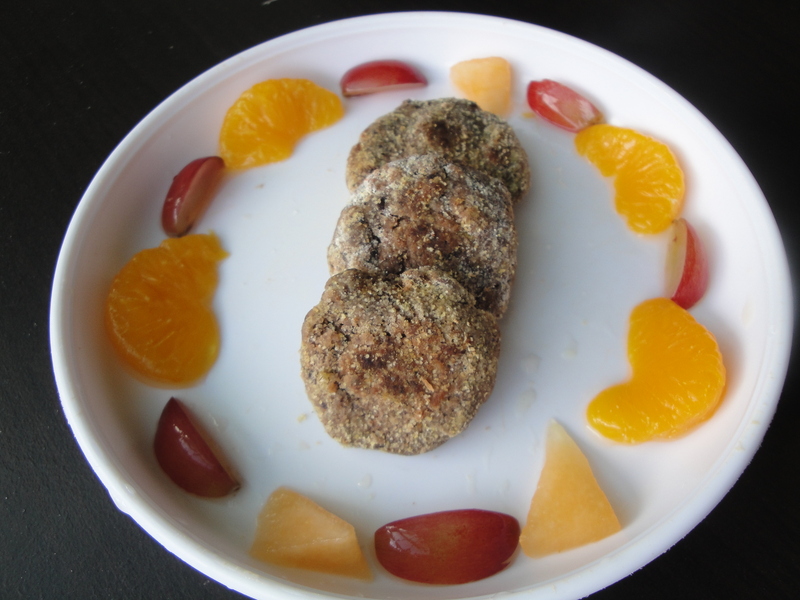 For young children, you could serve these as finger foods alongside cut up bits of fruits and vegetables, or dress these patties up by cutting pieces of bread into quarters and sandwiching the patties to make little sandwiches. These patties also freeze and thaw well, so get out the ingredients below and make a big batch for your family’s next meal! 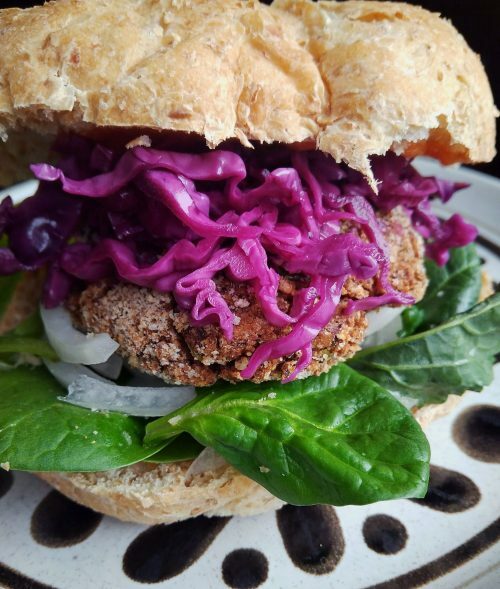 These tasty vegan, egg-free, dairy-free, nut-free patties are suitable for everyone in the family and for any meal in the day! Wash and scrub the skin of a small sweet potato thoroughly [240 grams in raw weight], then pierce the sweet potato with a fork a few times. Cook it in the microwave in a covered dish for 3 minutes. Let it cool, before peeling off the skin and cutting the sweet potato into rough chunks. Put this into a large food processor bowl. If using cooked black beans, measure out the amount needed in this recipe and place the black beans directly into the food processor bowl. Alternatively, if you are using canned black beans, drain and rinse the black beans well first before measuring out the amount needed in this recipe. Remove any excess liquid from the rinsed beans (I usually let the beans sit for a few minutes in a colander) then place the amount needed into the food processor bowl. Heat a teaspoon of oil in a small skillet or saucepan, then sauté the minced garlic and onions for a few minutes (until the onion pieces are soft and translucent, and the minced garlic turns golden in color). Transfer the sautéed garlic and onion pieces into the food processor bowl. Add into this food processor bowl the remainder of the ingredients (except the bread crumbs): chopped kale, flax egg, paprika, oregano, Cajun spice seasoning, salt and ground black pepper. Pulse a few times, stopping to scrap down the sides of the food processor, until the mixture thickens and can be molded. Taste and adjust the seasonings as desired. Place a few tablespoons of bread crumbs into a shallow bowl. Then, using your hands, form the final combined mixture into round flat patties. Dust both sides of each patty lightly with bread crumbs, before placing these patties on a baking sheet (the sheet can be lined with aluminium foil or parchment paper if desired). Heat additional olive oil in a heavy, well-seasoned skillet over medium heat. When the oil is hot, add the patties and cook on the first side for 5 minutes. Turn over carefully and cook another 3-4 minutes longer, or until browned on both sides. Choose unsalted or low sodium canned black beans if you can, or cook up your own black beans to use in this recipe. If the commercial breadcrumbs and canned beans used in this recipe already have salt on their ingredient lists, you may not need to add as much additional salt into this recipe. Taste the bean patty mixture and adjust the salt level as desired. To make gluten-free: Substitute the breadcrumbs with 1 1/3 cups of ground cornflakes [equivalent to approximately 160 g] when forming the patty mixture. Then place some ground cornflakes into a shallow bowl to use for coating the formed patties. To make the ground cornflakes, simply pulse gluten-free corn flakes down quickly in a food processor into a flour-like consistency. This actually gives the final baked patties a nice slightly crunchy texture. To make oil-free: Instead of the teaspoon of oil, substitute with 2 tablespoons of a vegetable broth in a heated pan to sauté the minced garlic and diced onion pieces. Then, instead of pan frying the patties on the stove top, bake the patties in the oven. ← How is Baby Led Weaning (BLW) Really Defined? These look great. Do you think an 8 month old could manage these? Hello! Thanks for your question. Yes, feel free to try these with your 8 month old. You can make the patties a bit thinner or cut them up into smaller bite-sized finger food pieces at the beginning when making them for your little one. Enjoy!